Life science companies are under increasing pressure to execute clinical trials faster with higher quality. As a result, more sponsors and CROs are looking for new ways to better leverage investigative site relationships to improve clinical trial performance. 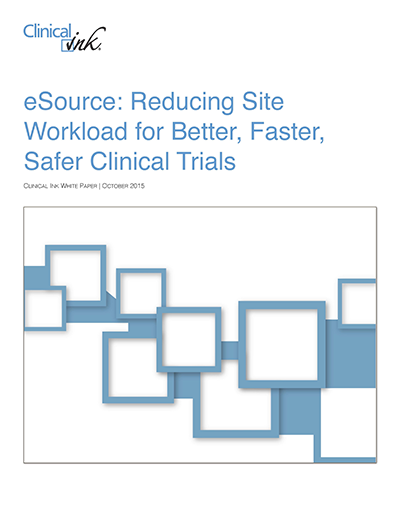 To this end, some clinical organizations have adopted electronic source (eSource) to help improve study quality and efficiency - for both sponsor and site. Unlike traditional electronic data capture (EDC), Clinical Ink's eSource platform SureSource was designed to minimize clinical trial complexity for site users. Clinical Ink's Site Impact Survey provides scientific evidence regarding the impact of SureSource from 517 site users. Results confirm that SureSource significantly reduces workload, lessens queries, and improves data quality compared to paper and EDC.